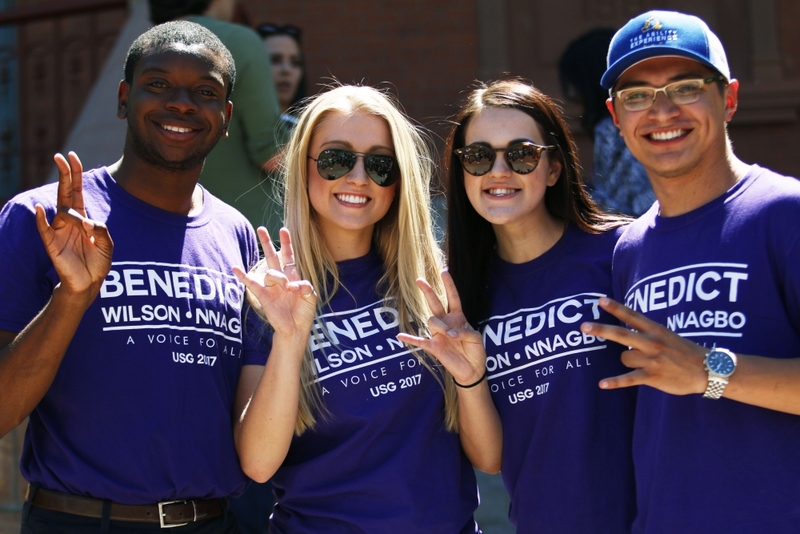 Photo by Delia Johnson and Delia Johnson | The State Press The Benedict Wilson Nnagbo campaign members celebrate after it was announced that their campaign won for USG 2017 at Old Main on the Tempe campus on Thursday, April 6, 2017. Brittany Benedict was elected the next president of Tempe Undergraduate Student Government on Thursday, after a runoff against Aundrea DeGravina. 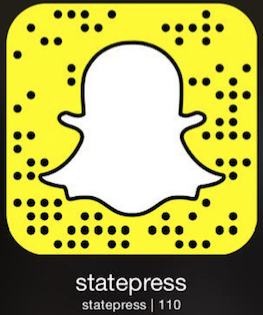 The results were announced from Old Main at 1 p.m. on Thursday afternoon, one week after the runoff was announced. Benedict and her ticket won with just under 56 percent of the vote, securing just under 400 votes more than DeGravina. Both tickets improved their voter turnout, with Benedict receiving 1,818 votes, and DeGravina receiving 1,432 votes. The Benedict ticket received the most votes in the original election, but fell short of the 51 percent needed to win it outright. DeGravina finished second in that election and closed the gap in the runoff. This marks DeGravina’s second runoff loss; she lost to Brandon Bishop in the 2016 election. President-elect Benedict received a boost in endorsements early in the week, with former opponent Kanin Pruter endorsing her ticket. Benedict said she and her team will take some time to celebrate before getting to work, but did not indicate what would be first on her agenda. Both tickets filed complaints against the other within the last two days, according to Nicole Delabarre, the assistant elections commissioner for the Tempe campus. Delabarre said the complaints should not affect the outcome as both tickets made the same complaints against each other. Benedict confirmed her ticket made two complaints and Dayton Potter, the DeGravina candidate for vice president of policy candidate, confirmed his ticket had also filed complaints. “As far as I’m concerned there was some logo stuff … nothing that I deem to be too serious but that’s not really up to me, that’s up to higher powers,” Potter said. Potter said the future is bright and congratulated the Benedict ticket on their victory.